The GMK Eclipse is finally live. The Tomb3ry designed keycap set is now here after a few months of development and waiting for the correct time-frame. 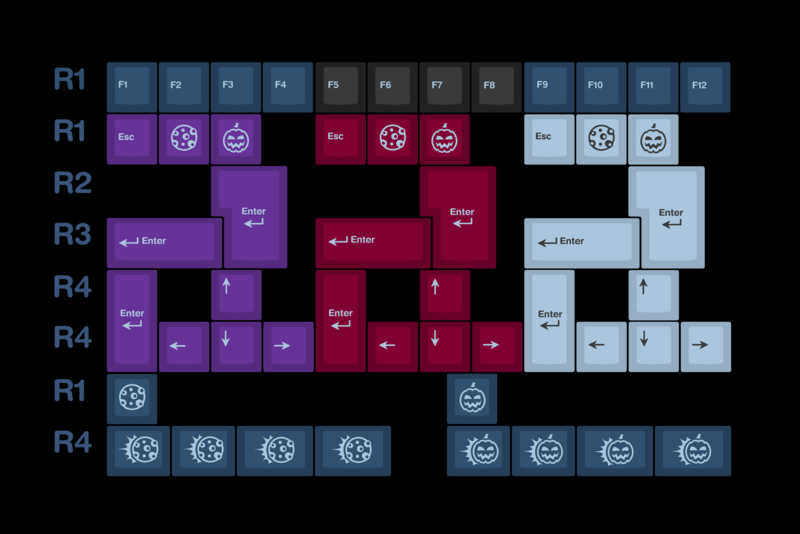 GMK Eclipse, brought to you by the designer of GMK Yuri and GMK Carbon, is the next set which Tomb3ry has been working on behind the scenes for the past months. 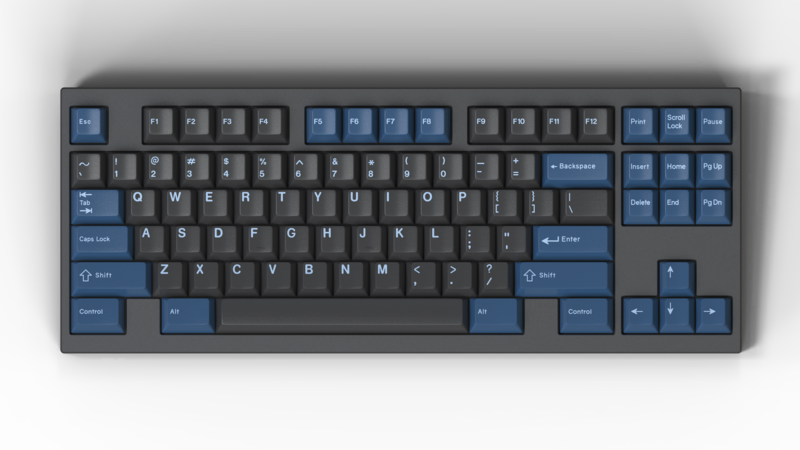 GMK Eclipse has been inspired by Solar Eclipses, with Halloween and Eclipse inspired novelty keycaps, this set is not to be missed. The GB Started on the 6th of October and is going for a month until the 6th of November 2017. We need to hit an MOQ of 250 for the base kit, we think it is doable. If you have any questions then me and Tomb3ry are available. The set was very slow to reach even 100 sets, which can sadly happen. Most orders were from the US and Asia, the ticker was automatic and real-time, we have been following customers opinions on the set and sadly the demand was not high enough with many people turning to other sets available at the time. Halloween was a busy time for the market and we think a re-run would be useful in a different season when enough crazy sets have been on the market and people want something more toned down. We have extended the GB deadline by a few days until the 15th, there have been a few sets bought in the last day but there is not much hope for the 250 sets that we need to reach. I wish the accent kits would have been split up I just looked and to get the accent kit + the base its going to be around 200 USD with shipping. Special since the main accent kit I want is the light blues. I guess I got to give this some thinking. Is there any chance the light blue accent kit could be a option then the other two kits be a secondary option that is bundled to cut down on price? There is a small mistake in the NORDE kit render, the tertiary legend on the second key from the bottom right should be a backslash and not a forward slash. Good catch :thumb: I've corrected in my mockup tho since TS is not me i cant update it. 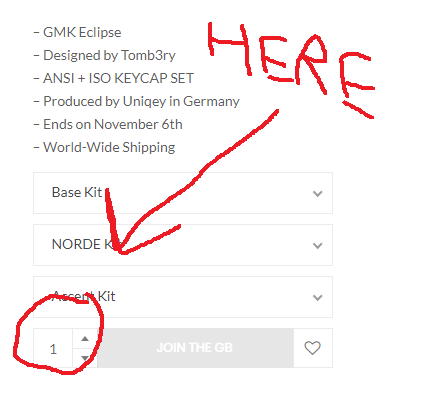 The website doesn't allow the "[GB] GMK Eclipse" item to be added twice to the cart. How does one order different quantities of each kit? Really pleased with how the kits turned out. I think I might just order this. Good job with the reading comprehension there. He said DIFFERENT quantities. So if he wanted 2 base kits and 1 accent there is currently no way to do that in 1 order. Nice screenshot though. Glad we all understand what a quantity selector looks like. Yes, but the cart contents for Eclipse seems to get replaced each time the join button is clicked. So, you can't add X base kits, Y nordes and Z accents. That's what I meant with "different quantities of each kit". Hoping this hits MOQ 500 cause then most likely order in. I am also looking since its not ending till to November perhaps I can split the cost over several paychecks. Novelties are all pad printed? Looks like I am buying another keyset. Welp. Any way to get fedex or some other carrier instead of DHL? I’ve had nothing but bad experiences with them so far and I don’t like the way they handle duty taxes. 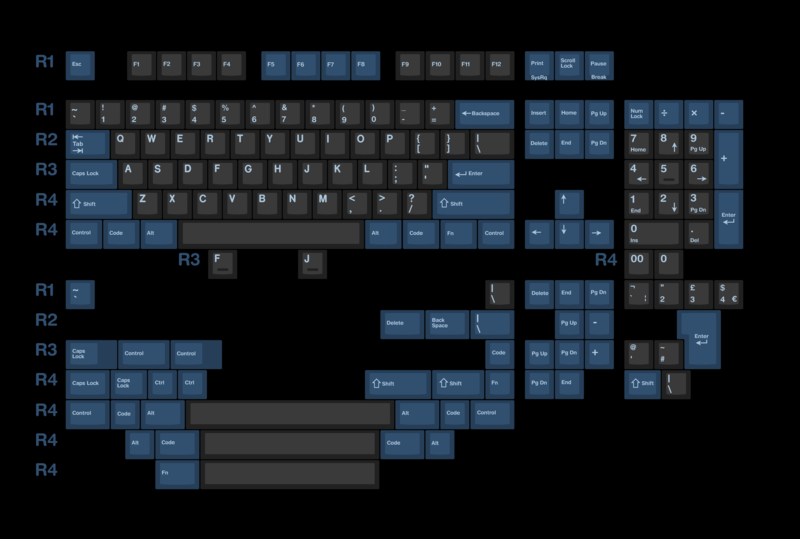 I've been waiting for another dark key gmk keyset, think i found it. Finally a set that supports ISO-DE layout. Just ordered the base and norde set. I'm really hoping this makes it to the MOQ! I've recieved the samples for GMK Eclipse modifiers. You can see the sample in the photo below (between light blue and N9 sample). As you can see its a deep blue color (not as deep as Yuri modifiers) with violet touch. Keep in mind N9 is not black but dark gray. I've added MG1 and DY samples to show off the possible color combination with accent kit. That deep blue is drool worthy. Come on people let’s get those orders in! Is it not possible to pay with Paypal? Is it not possible to pay will Paypal? Sure you can pay with paypall. If you get any troubles with doing so, then feel free to contact Candykeys with support@candykeys.com . I am sure they will help you. All payments can be made by PayPal or Bank-Transfer. You will get an e-mail at the end of the GB if it succeeds. You can also pay by Credit Card in worst case scenarios. I think the fact that you have to choose “Pay later” might be what’s causing the confusion. If someone doesn’t read all the way through the page they might think they have to pay immediately using the swipe option on your site. I'll be in for some Norde goodness! Is there any plans for us proxies, or if MOQ arent met? 13% after almost a week is rough and i don't think any set could sell 250 copies in europe alone. Its a shame since i love this set. I agree. It’s an amazing color combination and it would be a shame if it wasn’t made. I think a proxy might be a good way to entice some more buyers who worry about ordering something from Europe. What exactly is the worry about Europe? Aren’t candykeys in Germany where GMK is? Seems to me the process is gonna be the same either way. I think the real issue here is there are a lot of GMK gbs running now or about to start so they are all fighting for moq. Problem is EU is maybe 3rd of 4th biggest keycap buyer. Shipping etc that candykeys offer overseas is cheap, but people are hesitant to order from overseas and only a small portion do it. Especially if MOQ is 250, i think it would be important to have a presence in the biggest keycap market. Look at 9009 numbers for example. Latest numbers of #sales from europe is 37. Yeah but that’s based on where people are buying from. Stores in the internet work the same for everyone. Just because they are being sold in Europe doesn’t mean they have to sell primarily to Europe. 9009 would have sold just as well without a us proxy. Hype is hype. Your keys are going to ship from Germany to the us at some point. Why does it matter if it’s before or after they are being sent to you directly? I have already adressed that in my previous response. Wait, so your argument is seriously that you are hesitant to buy from Europe because other people are hesitant to buy from Europe for no reason? Worried about those Mad Cow Caps? I know my biggest hang up with this set is overall cost over 200USD shipped is way to expensive for a keycap set right now for me. The thing is I could just get the base set and it be cheaper but the base set.. isn't what sales me its the modifiers specifically the light blue. The fact there all bundled together and cost almost half the base set just pushes the price way to high. I really think that might be having a huge impact on the adoption rate of this set. I continue to watch it and see what happens but also juggling other group buys I want to join also. I think it’s people’s perception that it’s going to be more difficult to deal with because it’s coming “all the way” from Europe and might get lost. Having a proxy alleviates that worry because the entire NA order comes to the proxy. The timing with 9009 didn’t help either but I think it’s a combination of these things. This isn’t an opinion I hold and have already gone in for a set. Non-eu residents DONT pay any tax. Shipping is 12 euro (to US). Base kit is 113 euro. So a total of $150. I think this might not be clear enough, because its really really affordable. This is a good point. The fact that the base price isn’t in the units of the largest market hurts the GB. When browsing someone might look at the price and simply dismiss it as too expensive because it’s in Euros. Not saying that it’s a correct assumption but it is what most will think. That was with out the tax I went added it to cart and the base kit is not bad its when you add the modifier and shipping that it jumps to over 200 USD. I think its 180 USD with Modifier no shipping. The entire kit was 150 USD with modifiers that be great. $150 for both kits is quite unrealistic unless you sell Nautilus numbers. 1. I'm in europe, so not worried about ordering. 2. Numbers talk for themselves. 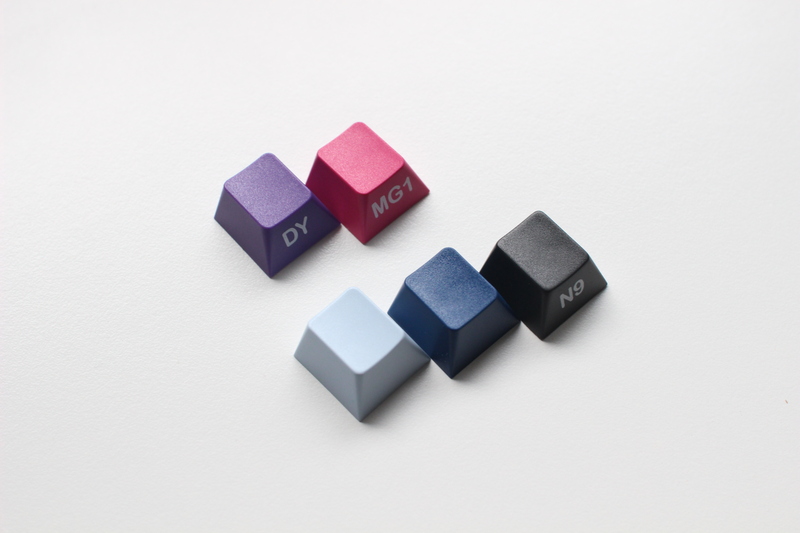 Keysets will sell better if it's a domestic vendor offering them rather than through a non-domestic vendor. Base kit + Accent kit + shipping to the west coast of the US is currently $232 USD (195.56 euro). Even if the base and accent kits reach their price breaks, it'll still cost over $200 USD ($208.27 USD / 175.55 euro). I like this set, but that's a little too expensive for me personally. Even if the base and accent kits hit their respective higher MOQ tier, it'll still cost over $200 USD ($208.27 USD / 175.55 euro). Base-set price is very good. The accent kit is quite expensive. Yeah, but the accent kit is part of the charm. The base kit alone doesn't interest me too much. Actually price is fair considering it contains both novelties + color mods in one. I really like the color pack though so might get it and split it up. The purple / red should work with yuri for example, since i belive its the same blue as legends, and the white addons can be used with any n9 set.